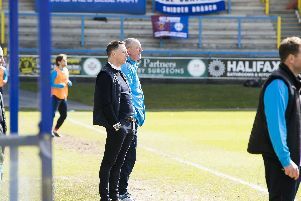 Neil Aspin said his players did the job that was asked of them after FC Halifax Town’s 2-1 win at Gloucester lifted them into the play-off places. An assured Town performance saw them open up a two goal lead before a late penalty made it a nervy finish at Whaddon Road. The Halifax boss was happy with what he saw from his side under testing circumstances. “Even at 2-0 at half-time, I knew the next goal was vitally important. I thought we defended really well, had a good line and a good shape defensively and they weren’t really causing us too many problems. “The penalty gave them a bit of a lifeline and then they threw everything at us at the end but I thought we coped pretty well defensively throughout the game. “When you’re 2-0 up, 3-0 kills the game but 2-1 puts them back into it so I would’ve liked us to have got that third goal but credit to Gloucester, they kept at it. Town have now reached the halfway mark in the league campaign, having played only 21 games in the Conference North despite reaching mid-February. But Aspin said he won’t use the fixture pile-up as an excuse and is determined to see more points on the board quickly. He said: “I’ve never known a season like it. We should be looking now to be playing one game a week. “Having to come here in midweek was unlucky in some respects and other things have conspired against us but I won’t use it as an excuse. “We’ve got to keep going and try to pick up as many points as we can. I don’t want to be waiting for the games in hand, I want to try and pick up points now and start moving up the table. The Town chief also confirmed the departures of defender Shaun Kelly and midfielder Tom Platt, although the latter could be back at the club soon. Aspin added: “Shaun Kelly got a full-time offer to go back to Australia, so you can’t stand in the lad’s way. “Tom Platt’s loan finished tonight but I have to decide whether we want to take him for longer and whether we need to bring in someone else in a different position.